Without a doubt, White Zinfandel, with its strawberry syrup-ness, has sentenced the entire class of rosés to a crude and classless reputation. But dry rosé has made a Brittany-esque comeback. Today’s new, snazzed-up pink wine is fragrant with strawberries and watermelon, and packs a tart finish fantastic for summer. My fridge is bloated with dry rosé wines all summer long, since it’s perfect for both day and nighttime, whether happy hour, picnic, lunch, dinner or brunch. I force it on everyone who crosses my threshold, explaining how the refreshing acids and understated tannins make it super food-friendly, matching both light fare and spicy food. The only thing bad about dry rosés is their lack of availability. They don’t exactly fly off the retail shelves since pink still suffers from marketing woes, so they unfortunately aren’t stocked very often. But seek and ye shall find. 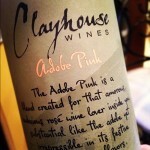 Especially this one from Clayhouse Wines in California’s Paso Robles. Although I drink dry rosé wines all year long, most people unfortunately lump them into the summer grog category. So by even releasing this blog post towards the end of May, I’m evidently crying uncle to the masses who lump. Dry rosés — and I’m not referring to the tooth-aching, sweet, pink-tinted swill that maligned the elegant reputation of fabulously dry rosés — are simply the best food pairing wines, the most refreshing and most crowd pleasing to those who are man or woman enough to drink them in public. Outside, the mercury hit 95 degrees (105 if you’re counting “heat index”). One swing of the door and the humidity slaps my face, sweat streams from my pores, and my fresh application of face powder degrades to a clumpy, taupe mess. My own private steamroom. Summer as a kid meant all play, everyday. Not sure I endured the heat then as extended daylight ushered in hours of Kick the Can, rope swings and hanging with friends. This last part hasn’t changed much in adulthood, but as summer plants its rump on my doorstep, backyard bonding over numerous bottles of rosé wine and grilled food become my new games. Allow this dry rosé to help you over a weekday hump. Steele, a California winery based in warm climate Lake County(northeast of Sonoma), makes this cabernet franc pink that smacks of tart cherry, even acidity and a refreshingly citrusy finish. Oh how I long for the days when Randall Grahm ran this place. Incredible and affordable, Big House was go-to reliable. But as a recent swig of this rosé attests, those days are gone. Candied sweet like a syrupy white zin, with misplaced earthiness and strong chemical flavors. Is that FD Red #5 I taste? Hails from a region just outside Provence in southern France and made from the relatively obscure cinsault grape. Flowery, honeysuckle aromas and banana chips, candied strawberry and wet rock minerality envelop the tongue. Light-hearted, refreshing and has an intriguing black pepper finish. Drink very cold.